One of the new features added to ColdFusion 9 is the Cache Template in Request setting located on the Server Settings > Caching page of the ColdFusion Administrator. The setting was recently featured in the ColdFusion 9 Performance Brief showing a 50x boost when enabled. 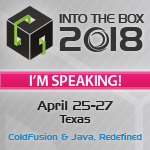 What Version of Java is ColdFusion Using? Adobe has posted a ColdFusion 9 Performance Brief, outlining several performance improvements over ColdFusion 7 and 8. The brief reports a 40% performance improvement over ColdFusion 8, and a 500% improvement over ColdFusion 7, running CanvasWiki. As you are probably aware ColdFusion allows you to use the integrated J2EE sessions that are provided as part of the J2EE server (by enabling the Use J2EE session variables setting in ColdFusion Administrator).